Long before the Golden Era, Muscle Beach and old school legends put bodybuilding on the map. Everything has a point of origin and has to come from somewhere. Such is the case with bodybuilding. Long before the Golden Era, bodybuilding was going strong, but it was still somewhat in its primitive stages. Bodybuilders were looked at as being narcistic and not very bright. It was assumed that they spent hours looking in the mirror and not holding down a full-time job. The public perception was that they were obsessed with their bodies and nothing else. Back then, bodybuilding wasn't a sustainable job and most bodybuilders had to have a second job to pay their bills. Many of them did studio work for the movies as grips and extras, allowing them time to train. Bert Goodrich was the first AAU Mr. America in 1937. He had a string of gyms in Hollywood that were more like fitness spas, but his title and publicity at the time brought a lot of people in to train. He was married to Vic Tanny’s sister and his gyms later morphed into the famed Tanny gyms credited with inventing the modern health club. 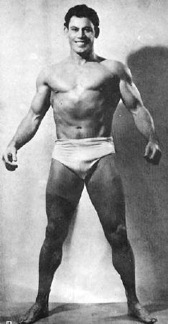 Vic’s brother Armand was also a Mr. America and received a lot of publicity in the early muscle magazines. In later years he became a writer for many of them. Also in 1937, Charles Atlas came on the scene with cartoonish magazine ads of a bully kicking sand into a skinny guy's face on the beach. It advertised his training course, which skinny guys could follow only to make a victorious comeback, defend themselves against bullies, and score a hot lady to top it off. The concept was actually based on Atlas' real life experiences. These ads were written in such a way that you had no choice other than to send for the training course. Everyone wanted to be a man of steel. Muscle Beach became popular among the bodybuilders. It gave them an outdoor platform to work out and get spectators. It wasn’t only bodybuilding but lifting, gymnastics, hand balancing, and strength events such as bending rods of steel with bare hands, driving spikes into wood, and ripping phone books in half. This was a lifestyle for many of them and it was a luxury of life for most.